One sunny month has passed since I planted the first seeds of my hopeful veggie garden in a section of our ugly front lawn. Neighborhood cats have dug it up (or buried it). My three-year-old daughter has given it a mild beating with her toy dump truck. And maybe I didn't do a great job at mixing the native soil with the organic compost mix I bought. 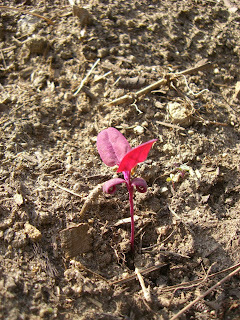 Not much is growing so far but a few of the seeds have actually become seedlings and for those I am excited! 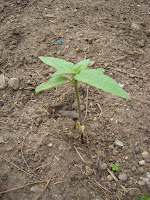 One such seedling is sprouting up at a rate of a half an inch a day, I think. According to my scribbled diagram, this could either be a red bell pepper or a sunflower. 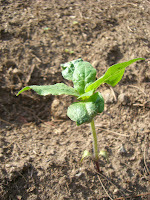 This little 5-inch baby is keeping me hopeful and enthusiastic about this whole front yard garden project. I mean, I argued with my hubby and dug up 2 small sections of his precious crabgrass against his urgent wishes so I could grow food and teach myself how to become a suburban farming mama...this HAS to work! There is a seedling growing very close to the first one that is doing quite well, too, and I think it is a different plant judging from how its leaves are straightish and not curly. An experienced grower would know exactly what these are but as for me I think part of the fun will be waiting to find out. In this same patch I have planted several types of veggies, herbs and protective companion plants like marigold, borage and nasturtium. The veggies are soy bean, strawberry (ok, a fruit), carrot, a lettuce mix, yellow tomato and red bell pepper. The herbs are chives and basil. The sunflower is there for the birds, for ambience and because they make great companions for tomatoes and pretty much everything else. Here is a pretty seedling from the lettuce mix I planted, which is a blend of about 10 different types of lettuce for fancy salads. The second section of lawn I have turned into a garden patch is also loaded with seeds of many different edibles but I planted it one week after the first one and as yet there are only inklings of things sprouting up. Those plants will hopefully become apple gourds (ornamental), nasturtium, chinese hot peppers, cilantro, a sunflower, marigolds, celery, strawberries, peppermint, oregano, broccoli and borage. I am keeping my fingers and eyes crossed. I cant wait to see how it goes. Is taht salad blend a mesculin mix? I was thinking about a patch of that. Yes, a mesculin mix it is.